The Pepper Tree (Schinus molle) is a commonly planted tree in the Mediterranean region. A native of South America, it has an elegant weeping habit, and a dense fine-textured canopy. Open clusters of yellowish-white flowers appear on the pendulous branches followed by loose clusters of red berries. The pronounced peppery taste of the berries accounts for its common name, the Pepper Tree. It is a popular avenue tree in Southern Europe. This evergreen tree can grow to a height of 8m, with a spread of 8m, and has a fast growth of 25 - 50cm per year. It flowers in June and July. The Pepper Tree grows in full sun, and is tolerant of heat and drought. It also tolerates poor soil and poor drainage. The Pepper Tree requires no watering once established. Generally, trees need supplemental irrigation to get established, especially if planted after the rainy season. During the first year, irrigate in the amount of 20 – 25 liters of water twice a week. During its second year, a tree needs to be irrigated in the amount of 40 liters once a week. Beginning with the third year, trees usually get established, and some, like the Pepper Tree, do not require any supplemental irrigation. Over watering of the Pepper Tree leads to chlorosis (yellowing of leaves), and branch growth that is prone to breakage. Old specimens have a heavy trunk, with a picturesque gnarled appearance. The knots frequently sprout leaves or small branches. 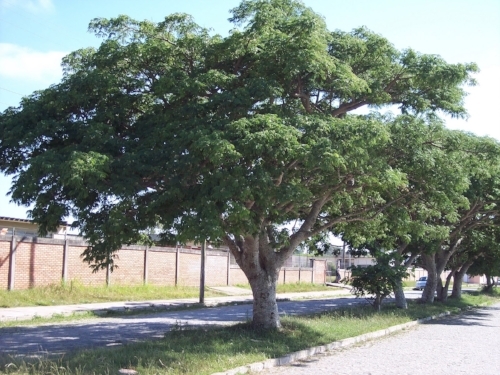 A specimen tree, distinguished by its dense shade; good for windbreaks and along roads; suitable as a solitary tree or in groups. Propagate by seed in spring, or semi-ripe cuttings in summer. Stake when young, and protect the trunk from sunburn until leaf coverage is sufficient. Requires light pruning to open canopy [? ], and maintain high branching if you wish to walk under it. Fruit is attractive to birds. Aggressive roots may break pavements.